Can you prevent membership in organized criminal groups if you are the SecDef? With more than 750,000 criminal street gang members in the United States (approximately the population of Austin, TX), government officials at all levels are searching for ways to restrict the negative impact of gang-related activity on the community. Many of these attempts have been challenged in the courts, in academia, and the media, having been deemed overly broad in scope, though specifically limiting solutions have been used with some success. H.R. 4986: National Defense Authorization Act for Fiscal Year 2008 Section 544 – became law (Public Law 110-181), and requires the Secretary of Defense to prescribe regulations to prohibit the active participation of military personnel in street gangs. The bill was passed by both houses of Congress and signed by the President back in January, yet here we are, more than six months later, with no changes to military policy on gang membership. It didn’t take that long to pass the USAPATRIOT Act. Perhaps we are being more careful. Or, perhaps we are trying to see if denial works yet . . . This was from an investigative Task Force formed in response to an Extremist-related killing that was looking to see if there was a problem with Extremists in the Army. The task force visited 28 major Army installations in the United States, Germany, and Korea during January and February 1996. After conducting over 7,000 interviews and 17,080 written surveys, the task force concluded that there was minimal evidence of extremist-group activity in the Army . . . 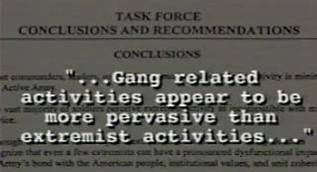 They did note there was more of a “security concern” with street gangs. Do you wait twelve years to process this new information? So here we are twelve years later, Congress AND the President agreed with the Task Force’s report, and after six months . . . nothing. The NFL gets it, why not the Secretary of Defense?